As is well known, the Makhnovites do not recognise the regulations of the Red Army and have created their own organisation, allegedly based on ‘free’ anarchist principles. It is of very great interest and importance for not only every Red Army man but also every worker and conscious peasant to learn what these ‘free’ anarchist principles look like in practice. It is now possible for us to get to know them close up. The Revolutionary War Council of the Southern front despatched some responsible workers to the headquarters of Makhno’s troop, and, when they had familiarised themselves with the situation on the spot, they reported on it in detail to the Front Command. We extract the most important sections of this report. 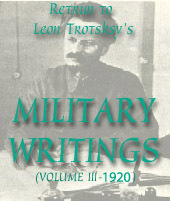 In principle – that is, in words – organisation of Makhno’s troops is based on electivity of commanders, on volunteering by all the fighters, and on the strictest ‘self-discipline’. Let us examine these principles, one by one. The principle of election exists only in words, that is, as an outward ritual. Commanders are selected by Makhno himself and his closest collaborators. True, commanders (from platoon to regimental level) are presented for approval by their units. But this is an empty formality. If there is any disagreement, the last word lies with the senior commander, who actually appoints whoever he considers necessary. To this we must add that commanding cadres are very few in numbers, and so it is natural that the fighters have to accept the commanders given them by Makhno. The voluntary principle. Makhno does not carry out any general mobilisations, nor would he be able to do this, given his complete lack of the apparatus needed. But the guerrillas who join his troops are not at all ‘free’ to leave it. Anyone who voluntarily leaves the troop is regarded as a traitor and is threatened with a bloody settlement of accounts, especially if he joins a Red Army unit. Consequently, the ‘volunteers’ feel that they are held in an iron grip, and cannot leave the troop. To this it must be added that the troop includes some non-volunteers, for example, a choir of Estonian musicians, the medical personnel and others, who were taken prisoner and carry out their duties under compulsion. As for the anarchist ‘self-discipline’, this is on the same footing as ‘electivity’ and ‘voluntariness’, and perhaps even exceeds them in the brutal forms it takes. According to anarchist theory, self-discipline must be maintained by the rebels themselves, without any compulsion from above. But there is no question of this being the case in the troop. The commanders, especially the highest of them, actually enjoy unlimited powers. It is enough to mention that the custom of striking men ‘in the mug’ (as this is described in the language of freedom and brotherhood) is widely practised. Shooting without trial, ‘on the spot’, is also widely practised – not only during battle but also in peaceful situations. The methods of striking ‘in the mug’ and shooting ‘on the spot’ are employed by ‘Daddy Makhno’ himself. For his own protection Makhno has a ‘Black Squadron’ in which, as the Makhnovites put it, discipline is ‘diabolical’. Makhno’s quarters are guarded by a strong squad of between five and seven sentries. Strangers are not allowed to approach Makhno without being disarmed. He has his own Cheka, called ‘Counter-Intelligence’. The army possesses gold, diamonds and other jewels, valuable furs and other clothing, all this being, to a noticeable extent, mostly held by the commanders. That is how the anarchist principles appear in practice. An army cannot, of course, be built upon principles of freedom and independence, for each and everyone, like, for example, a literary club. But it is quite obvious that in our regular Red Army there is incomparably more freedom and more respect for the Red Army man’s personality than prevails in Makhno’s ‘anarchist’ troop. When, not long ago, in one of our armies a responsible and meritorious comrade, while in a state of extreme nervous excitement, struck a Red Army man, this worthy comrade, who held a post of responsibility, was at once relieved, taken away and punished. Meanwhile, in Makhno’s troop blows in the face are considered a means of ‘self-discipline’. Every Red Army man must be made aware of the actual methods used in the Makhnovite organisation: he will then appreciate more highly the regime of our Red Army, which is increasingly filled with consciousness and the Communist spirit, and in which free devotion to duty is increasingly replacing compulsion and coercion. 1. The tachanka was a light, sprung cart drawn by two horses (used by Ukrainian peasants), on which Makhno mounted a machine-gun, with two men to work it, plus the driver. His extensive use of these tachanki gave Makhno a powerful combination of mobility with fire-power, and the device was copied by the Red Army. See Babel, Discourse on the Tachanka, in his Collected Stories (1955).